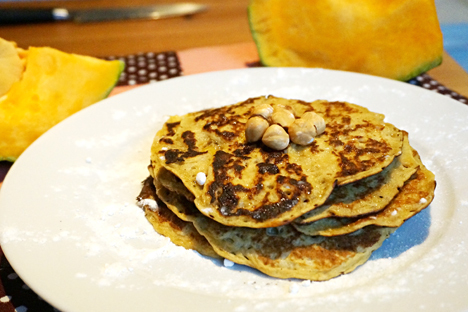 Pumpkin pancakes make for great comfort food at the start of the long and cold winter season. November is truly here and almost gone. It’s not the best time of year in Moscow – gray, cold, rainy, and the days get very short. SAD (seasonal affective disorder) has spread its wings by now. SAD must be a recent phenomenon, because when someone is down my grandmother says: “He/she has…it’s called… dep-res-sion!” Her look implies that Soviets only learned the term to talk about modern-day “softies” and certainly never had time for it themselves. In Russian, the words for “recipe” and “prescription” are the same: “retsept”. Luckily there’s a pumpkin pancake recipe in the Book – in the “old recipes” section – as a prescription to cure that “softie” SADness. It looks like the perfect comfort food. It grabbed me when I saw it in summer, but I patiently waited till it was autumn and I could justify a pumpkin recipe. Pancakes have been around for a long time in Russia. Round, hot and golden, they remind us of the sun, and are therefore baked during Maslenitsa – the pagan holiday of welcoming spring, during which pancakes are consumed non-stop for a week. I get very keen on paganism that week. And then very keen on the gym the week after. During Soviet times, Maslenitsa was still quietly celebrated in apartments, although not as widely as it is these days. It seems like Russians consider themselves a cut above anyone else at consuming pancakes. I can just hear someone in a Russian town saying, “I’m not proud of much, but I sure know how to down a couple of dozen pancakes.” Chekhov wrote a short story called ‘Stupid Frenchman’, in which a Frenchman thought the Russian next to him was trying to commit suicide by eating too many pancakes, whereas the Russian was just having his normal appetizer. Opera singer Galina Vishevkskaya wrote in her memoirs that when they had foreign guests over they never had much food to offer, but thank goodness those foreigners got full on three pancakes each. Needless to say, no Russian would ever be full on three pancakes – they may have their citizenship revoked! To prove my Russian-ness by pancake-eating, I devoured my pumpkin pancakes in just a couple of sittings (minus the 3 my husband took to work). They aren’t like the Soviet food I’m used to – especially if you add some cinnamon – and in fact it isn’t a genuine Soviet recipe (as it comes from the “old recipe” section), but they make for a lovely addition to the Book and are sure to cure any autumn blues. Plus you can recycle the process in a few months for Maslenitsa! Cook 1 kg pumpkin, peeled and cut into cubes, until soft. Press through a sieve to make puree. Pour pumpkin puree into 1 litre of milk and heat until it is the temperature of fresh milk. Into the milk-puree mix, add 15g yeast and 3 eggs. Add 2-2 ½ cups flour until the dough is the right consistency. Put in a warm place and let sit for two hours. Then, add 1 tbsp oil, ½ cup sugar and a sprinkle of salt. Again let it sit in a warm place until it rises. Then, form and cook the pancakes.